Light Blue H&M Shirts first surfaced on Chictopia's streetstyle gallery in Fall 2010 seen on Ludlow, Shropshire, UK blogger llymlrs of llymlrs.com. She wore her light blue H&M chambray shirt with a camel new look peacoat coat, black H&M body con skirt, and black Craft store necktie ribbon necklace. 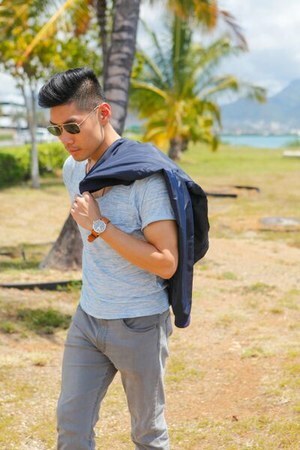 Since then, Light Blue H&M Shirts have grown in popularity as bloggers from Los Angeles, Toronto, and Brooklyn have discovered them. Light Blue H&M Shirts are generally seen in casual, chic, and comfortable style. 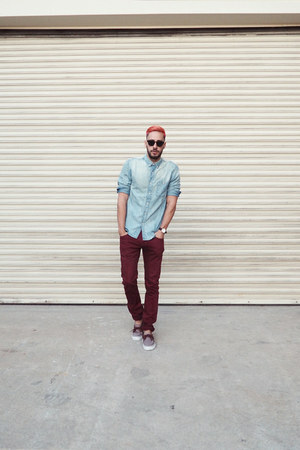 Popular types of Light Blue H&M Shirts are jeans, striped, boyfriend, denim shirt, and chambray. There are currently 202 streetstyle photos of bloggers wearing Light Blue H&M Shirts. Most recently, blogger nanysklozet of nanysklozet.com rocked her light blue H&M shirt with a black Guess? boots, black Forever 21 hat, and black Danielle Nicole bag.